We already know that Hollywood is obsessed with plastic surgery, cars and money. Many of the actors we loved look completely different because of that. One thing that we didn’t see right away is the obsession with bathtubs in movies. Bathtub scenes are memorable. There are several reasons why these scenes are popular in Hollywood movies. First of all, we know the actor in question is naked. Whatever the body shape may be (and usually it’s steaming hot), something in our brain clicks at the thought of a seeing a stark naked person. Curiosity is doubled with expectation – you never know how much flesh is going to be exposed, if there are enough bubbles, or how big the towel is, if any. You also know you’re watching this scene for a reason – the director is showing it to prove a point. And it’s not because you’re supposed to pick up something from the character’s hygiene routine. So, let’s take a look what kind of message a single bathtub can send us. 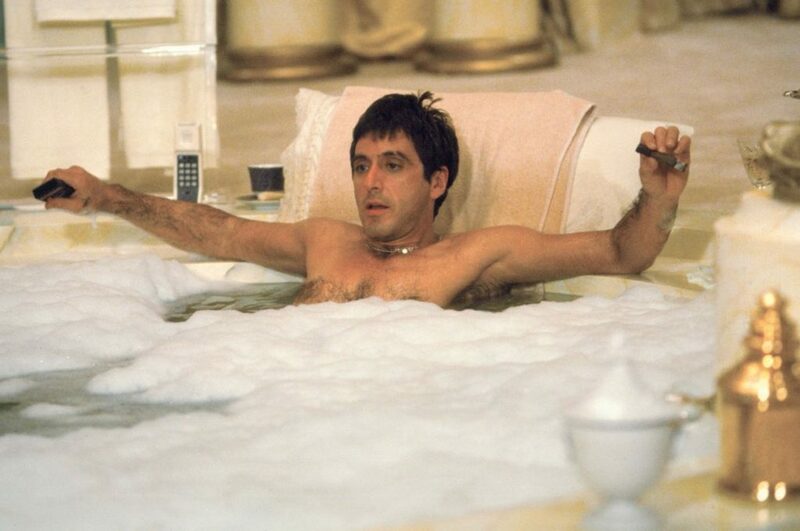 If you want to show someone’s wealth, just show them off having a luxurious bubble bath like Scarface did. This epic scene defined Tony Montana as a big boss, even more than sitting on a ton of cocaine. We all remember the sharp contrast of the bubbles, gold, and the dissatisfied, disgusted expression on his face. Even Al Pacino said that only the devil is more evil than Tony Montana. More often than not, a bathing ritual is used to show how the hero is just another human being. It illustrates how movie characters can be vulnerable, both physically and emotionally. Actually, isn’t it as close as one can get to experience a womb? Floating in liquid, trying to feel totally tranquil and carefree… Hence, this probably helps us sympathise with the character in this situation. Being vulnerable only increases the chances of a perfect murder. There was a scene in Godfather II, and the cowboys never EVER took a bath without their faithful revolver at their side. Remember the scene from A Nightmare On Elm Street? Well, you’d better try to erase that one from the memory the next time you decide to have some time for yourself. If you really want to show the intimacy of a couple, then just throw in a bathtub scene. There’s something about the bathing ritual which speaks volumes about a relationship. You know if they’re cuddled together in lukewarm water, they’re totally in love and comfortable with each other’s bodies. Just think of Fifty Shades of Grey, or Angelina Jolie and Antonio Banderas in Original Sin. Steamy, isn’t it? Having already acknowledged the hero is suffering from depression and feeling utter disappointment with his/her life, you know what to expect when you see them in the bath tub. Will he, or won’t they cut their own wrists? Or perhaps try to see what it would be like to drown? The suspense is killing us/them. Fortunately, not everything has to be super serious about taking a bath. Bubbles are supposed to be fun, and people are expected to relish the experience and splash around like little kids. Just like Julia Roberts did. Plus, we all remember that Chandler moment and his wish to “relax after a long day”. Finally, there used to be a scene with a bath tub to show the turning point in a hero’s life, when they are having a makeover. Today, that’s usually depicted through a scene at the beauty salon, but in the old days, if you wanted a character to shine (literally), you first gave them a good ol’ rub! Indeed, had Shakespeare lived today, he most certainly would’ve used it in his scenes. Such an ordinary thing, and yet always summing things perfectly. Having a bath tub scene is always a sure bet.